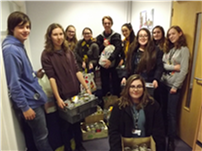 At the Uckfield Community College, with the support and assistance of the teachers, Uckfield Lions have a Leo Club with an emphasis on community service. Members are eligible to join from the age of 12 up to when they leave school. Uckfield Leos Club was first formed in 2000 at Uckfield Community and Technology College. It is based in the Sixth Form and supported by Uckfield Lions Club. During its life the students have raised about £8000 which has been used to support local and national charities. At present the club has 16 members who meet regularly to plan events and decide which charities to support. During 2017 & 2018 the Leos have provided collectors for Uckfield Carnival, have held cake sales in school, had a stall at UCTC’s Christmas Fayre, organised a Christmas collection of goods to donate to the Uckfield Foodbank and helped with the Ucfield Lions Santa's Sleigh Collections. In March 2018 the Leos ran a game at the Zones ‘It’s A Special Knock Out’ at Bedes School. 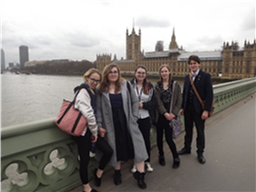 Later in the month a group travelled to the House of Commons to attend the 2018 Lions United Nations Day. After drinks and cakes in the cafeteria at the Palace of Westminster, the Leos entered Committee Room 14 to listen to presentations on the refugee crisis, UNESCO, and the role of the Lions within the UN and a talk by the incoming Lions International President Gudrun Bjort Yngvadottir. More recently the club have held a raffle for a giant Easter Egg, had a stall at the Lions Fun Day and provided marshals for the Uckfield Lions10k Run. So far this year they have donated money to the Children’s Respite Trust, situated in Uckfield, Parkinsons UK, the Alzheimer Charity and Prostate Cancer. The majority of the club will still be at school in 2018/2019 and, hopefully, will be joined by new members from Year 12 and be able to expand its activities and fund raising opportunities. The Lions Leo Program provides the youth of the world with an opportunity for personal development through volunteering. There are approximately 144,000 Leos in 5,700 Leo clubs in more than 140 countries worldwide. Uckfield & District Lions Club formally re-formed their Leo Club in 2010. This has been achieved by working with the school & the Leo club has around 15 members each year. Membership is always a problem with Leo Clubs as members are constantly going off to further education or moving away to pursue careers. It is vital that the club has new members each year , so any students interested in joining Uckfield Leo Club should contact the school or see our contacts page. 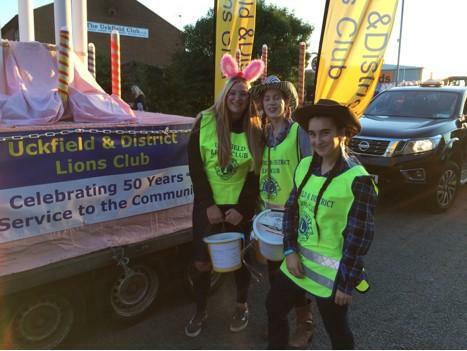 Uckfield & District Lions can also be found on Facebook.